Life can feel overly full, with little outlet for refreshment. It’s important to take special time to nourish yourself, so you can re-energize, rejuvenate, and heal. That’s why I created the Lalita Ayurvedic Sanctuary. It’s a quiet, hidden retreat where you can slow down and enjoy one of my special signature treatments. Garshana – a full body dry skin exfoliation technique to enhance circulation, open the lymphatics and clean the skin so the oil treatments penetrate deeper. Abhyanga – an oil massage using customized warm herbal oil and flowing strokes to open channels of detoxification, relax the mind, and allow the body to let go. The focus is on the magical Marma Points of the body to help integrate and relax. Swedana – a steam tent designed to release toxins while keeping you totally comfortable. Your head is outside the tent to keep you from overheating, keeping you cool. A customized face mask is applied along with Nasya oil for the Nasal sinuses, and a Marma Point facial massage. Your Bliss treatment ends with a customized healing bliss drink based on the season and your personal constitutional needs. Just when you thought life couldn’t get more blissful, this two-hour treatment combines the Bliss Treatment with the final sacred and very ancient treatment called Shirodhara. A stream of warm, herbalized oil gently and continuously flows across the forehead to help synchronize the right and left hemispheres of the brain. 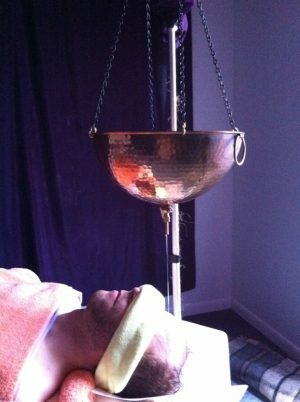 Considered to be one of the oldest methods on the planet for releasing stress held in the deep nervous system, our treatment is given by hand using a copper pot to bestow deeper healing. Take advantage of deep discounts on the Bliss Treatment Plus. One weekend every month, I lower the prices on this special treatment at Lalita’s Ayurvedic Sanctuary. Come experience back-to-back treatments that include Marma Points, an Abhyanga massage, cleansing through Swedana, and then relaxing during Shirodhara, as warm oil lightly drips on your forehead. It all ends with a healing Bliss Drink. These clinics book up quickly. Contact us to find out about the next date and make your reservation.